The Virginia Center for Inclusive Communities is pleased to announce a new resource for Richmond-area nonprofit organizations. 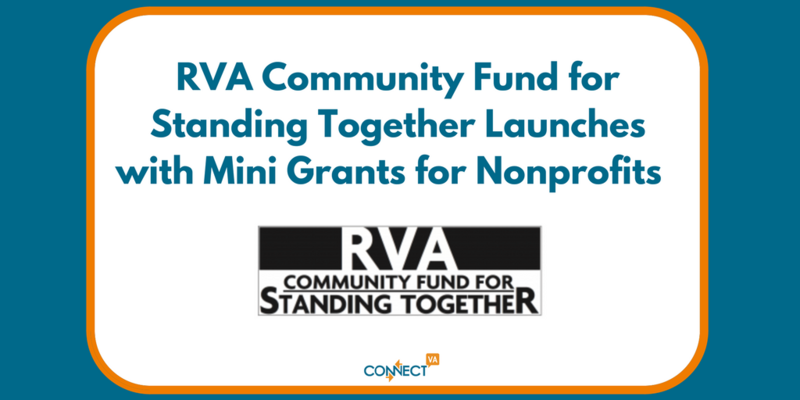 Thanks to initial funding from the Robins Foundation and fund management from the Richmond Jewish Foundation, the RVA COMMUNITY FUND FOR STANDING TOGETHER was launched on August 21st, 2017. This funding opportunity supports Richmond-area nonprofit organizations with financial support for rapid response services after incidents of bias, discrimination, or bullying. These incidents often require immediate interventions that are not covered by traditional funding mechanisms. As such, this fund ensures that nonprofit organizations will have greater capacity to meet needs that are increasingly urgent in today’s climate. Nonprofit organizations are invited to apply for mini-grants of $500, $1,000, or $1,500 to support interventions including facilitating, convening, counseling, and coaching. Jonathan Zur, President and CEO of VCIC, says that he encourages organizations to apply for funding to support community-wide solidarity events after incidents of bias or discrimination, schools that need professional development or student workshops after bullying etc. The grant application form is can be found online at http://www.inclusiveva.org/standing-together-rva/fund/. Completed application forms can be submitted at any time to communityfund@inclusiveVA.org. Applications will be reviewed by an objective, diverse committee on a weekly basis, and approved requests will be funded within two weeks. This RVA Community Fund for Standing Together will exist until all resources are expended. Individuals or foundations interested in donating to support this effort can go here http://tinyurl.com/rjf-donate and select “RVA Community Fund for Standing Together” in the “Fund Designation”. Contact the Virginia Center for Inclusive Communities by emailing jzur@inclusiveva.org with any questions and please spread the word about this opportunity! To learn more about Standing Together RVA go here.